The compliance error can be ignored if the issue is only a device ID mismatch. To avoid generating a compliance error, you can also disable the PSA and NMP profiles under Storage Configuration in the host profile as long as the storage configuration uses the default PSA or NMP profile settings. In the Host Profiles view, right click the host profile and select the second option, Enable/Disable Profile Configuration. Expand /unfold the Pluggable Storage Architecture (PSA) configuration. 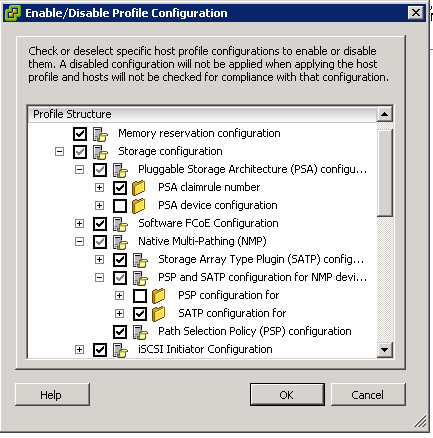 Deselect the PSA Device Configuration profile. Expand /unfold Native Mulitpathing (NMP). Expand /unfold PSP and SATP Configuration for NMP Devices. Go back to Profile compliance and click Check compliance. Und dann klappt es auch mit dem Hostprofile. Der Beitrag wurde am Dienstag, den 17. Januar 2012 um 14:43 Uhr veröffentlicht und wurde unter EDV Probleme, ESX abgelegt. du kannst die Kommentare zu diesen Eintrag durch den RSS 2.0 Feed verfolgen. du kannst einen Kommentar schreiben, oder einen Trackback auf deiner Seite einrichten.